Recently I made two sets of dreads, both with a peacock theme. I've been trying out a new method of making dreads, so they're a lot more textured and organic looking than my usual ones. Firstly I made a set for depechemaid which combined regular and textured dreads - she did a showoff here of the original set, but she then ordered some textured accent dreads in teal. Altogether there's all different blends of purple, black, dark red, rasberry and petrol green. I think I used 7/8 shades in total. Secondly I made a set for NozomiStar. These have a black base with 10 each of purple, blue-black and light petrol green (they were supposed to be darker but it worked out okay), and again I experimented with texture with some blends. You can see the difference here between my normal dreads and the new ones. I can't wait to see them installed! these are effin lovely... i LOVE the texture on them... and Kirty looks amazing as always! I cant wait to finish her set . Totally loving the 2nd too... im all about turquoise and aqua atm!! 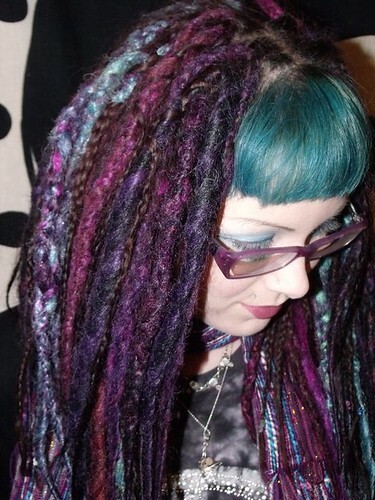 I commented on Kirsty's dreads when you originally made them, they are some of my favourite synth dreads ever. The texture and shade blending is simply stunning. Both sets are just gorgeous. I adore the bottom set!!!! WOW!!!! Those are awesome and you compliment them perfectly! Beauuuttttttttiful! I like them very much nice colour pallets. That first set is a triumph. Absolutely beautiful. Oh my gosh They are absolutely adorable! I love, love, LOVE them! I like the second kit! lovin the texture and the blends! gorgeous!! i LOVE organic rough textured natural looking dreads! You guys are so nice with your lovely comments, it has made me smile:) All I see when I look at pics of myself is how much the lenses in my glasses distort my face! 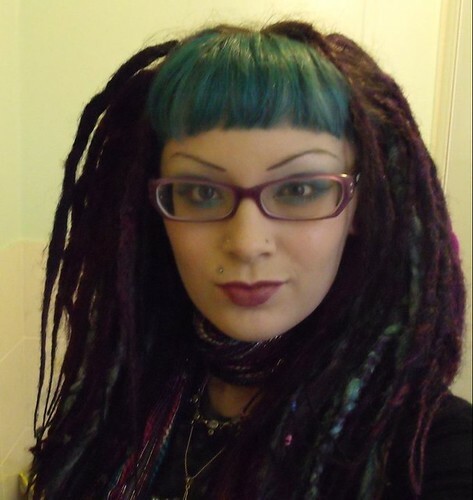 I love these dreads and have had so many nice comments about them, the plummy ones have been worn on and off for months and been through the washing machine twice and are still in great shape and I love the colours and textures in the tealy/turquoisy ones! Totally recommend Laura for your dreading needs! Nozomistar's set are beautiful too, I want them! 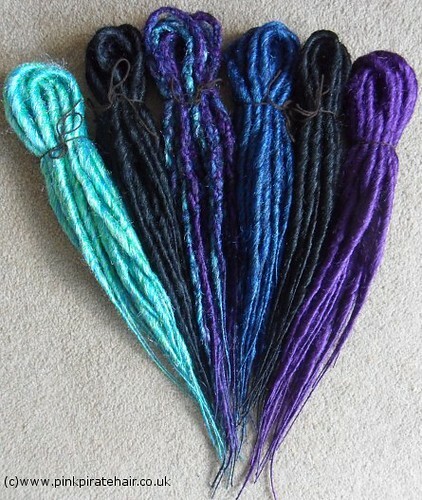 The dark purple/turquoise textures ones in particular are YUM! Just stunning! l cant begin to compliment the colour choices in the installed set enough!